Your Google Business Listing is a key tool in the Local SEO world. You’ve no doubt seen these before if you’ve done any amount of Googling of local businesses. On desktop you will find them to the right of the search results and on mobile they will be directly on top. They provide searchers with pertinent details about your business and can sway the decision of a potential customer. So it’s vitally important to be utilizing all of the feature that Google allows you on your own listing. Below we’ll discuss five features your business listing may not be utilizing and why it’s so important to do so. 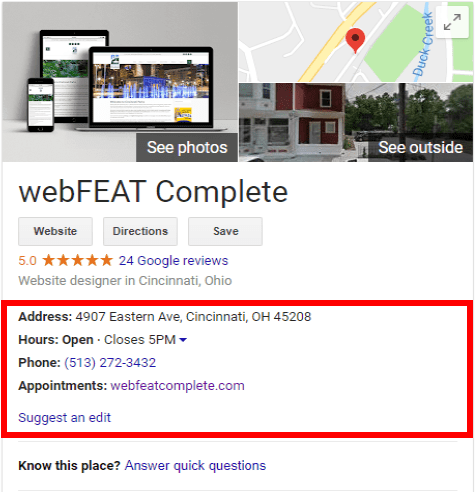 This one may seem fairly obvious but we see far too many Google Business Listings out there with incorrect, out of date, or even sometimes just plain missing business info. It’s pretty easy to understand why this information is so important. The customers facing reason is that you want people to be able to find and or contact you without having to hunt down the correct info. Often time users will contact you directly from Google without ever visiting your website so it’s crucial this info is correct. From Local SEO side search engines use NAP (name, address, phone number) as a barometer for a business’s existence. Every single one of your listings online need to be the same or a search engine could identify your business inaccurately. As an example, your information on Yelp needs to be consistent with your information on Google. Even small things like a misplaced apostrophe, or using “St” on one and “Street” on another one could affect it. We’ve written extensively on the importance of gaining online reviews so we won’t go any further into that. However, one feature that many don’t fully utilize is the ability to respond to customer reviews. Responding to a positive review makes potential customers almost 70% more likely to trust a local business. And if you think about it it makes sense. A response from a business owner shows they care about their customers and truly appreciates their business. Think of it as a digital smile from the owner. Conversely, responding to a negative review is just as important. This too shows that you as a business owner cares about their customers. It also allows you the opportunity to resolve the issue privately and could potentially cause the customer to remove the negative review or even update it to a positive. More and more users are turning to search engines to get information about local businesses. And a big feature that many aren’t taking advantage of is the services/menu feature within their Google Business Listing. By listing your services and descriptions directly on your listing you are making things much easier for potential customers. Not only does this give them the information they are looking for front and center but it gives them the opportunity to see potential services they may not have known you offered. Again, going back to the previous feature and another obvious one that still not many businesses are taking advantage of is the About Us section. 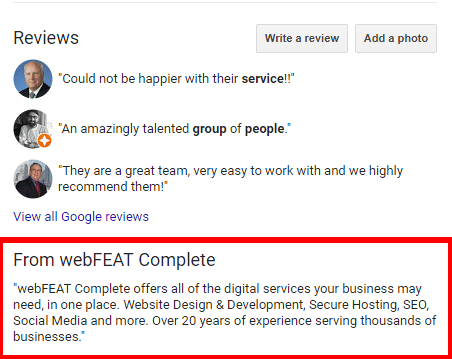 Making sure to include a concise yet informative about us section about who your company is and what they do a potential customer should have all of the information they need from your Google Business Listing without every having to visit your website if they don’t want to. They’ll have a description of your business, how to contact you, what services you provide, and customer reviews all in one location. It’s important these are all up to snuff if you really want to attract new business. 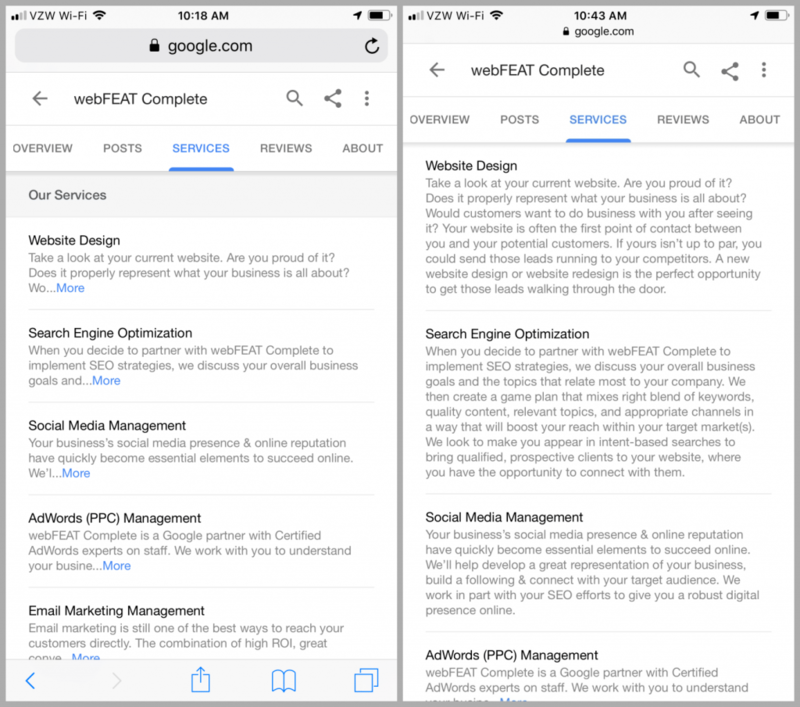 Lastly, utilizing Google Posts within your Google Business Listing is important for a couple of reasons. First, It shows that you are a thought leader in your industry. By posting your blogs here you are allowing potential customers to see your expertise first hand. Aside from thought leadership Google Posts have some other uses. This is where you can post Events you are having, Offers your currently promoting, or new products/menu items you will be selling. Google Posts are a great way to show people what you have going on without them having to dig through you website. 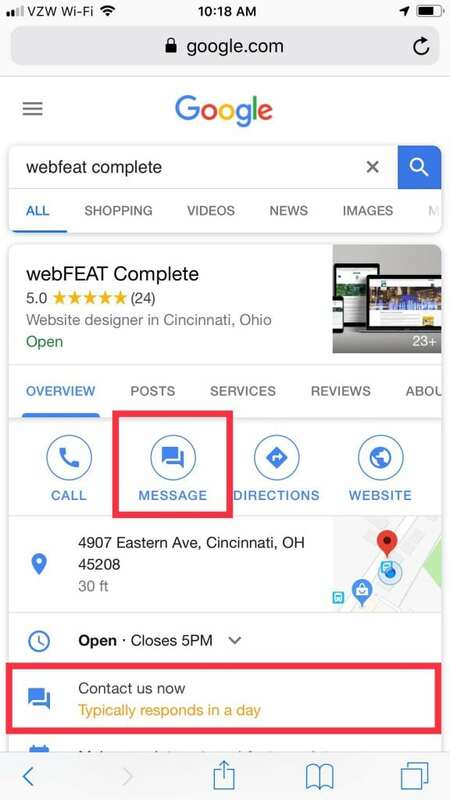 You can link your cell phone number to your business listing so your customers can send you a message directly from their phone. It will also show a user the typical response time so if you use this feature it’s important to respond in a timely manner. 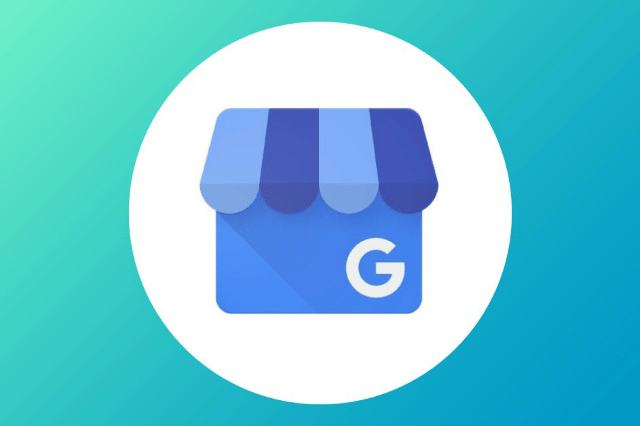 If your business is a brick and mortar location that customers visit then you may want to add a Google Business Tour. 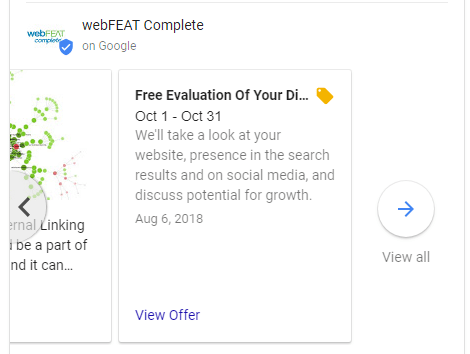 For a fee you can hire a Google representative to do a thorough mapping of your business and have it connected to your Google Business Listing. This gives someone the ability to do a virtual realty tour of your business directly from their computer. This is useful if you are a retail store or restaurant and you want to give someone a better vibe of your establishment rather than just pictures. Some of the things in this post are easily remedied. Other though require constant monitoring and adjusting to make sure you’re getting the most out of your listing. Part of our Local SEO services inludes the management of these and other listings around the web including Yelp, Facebook, Angie’s List and the other hundreds of online directories around the internet. Is your Google Business Listing looking a little sad? Get in touch with us and ask us how we can help supercharge yours and start getting your more leads.